My kids are out of school for the summer. I am always looking for fun things to do with them to keep them active and happy without spending a fortune. I’ve found that hiking is an awesome way to do that! 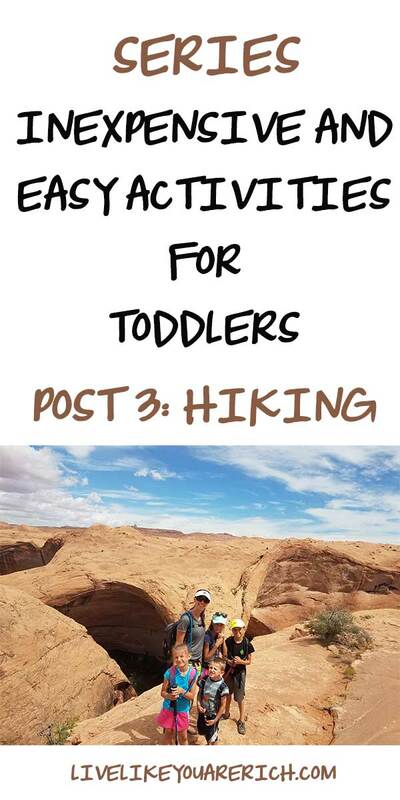 Here are 12 Tips for hiking with kids. 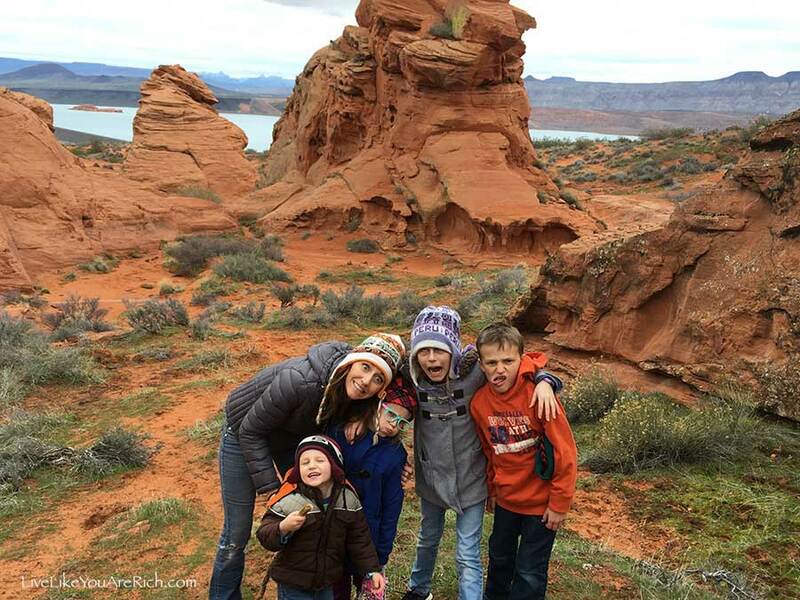 My friend, Julene, is an avid hiker and has some amazing tips for all of us parents who want to go hiking with our kids! Welcome, Julene! A great hike can be one of the summer’s highlights whether you do it near your own home or while vacationing somewhere else. 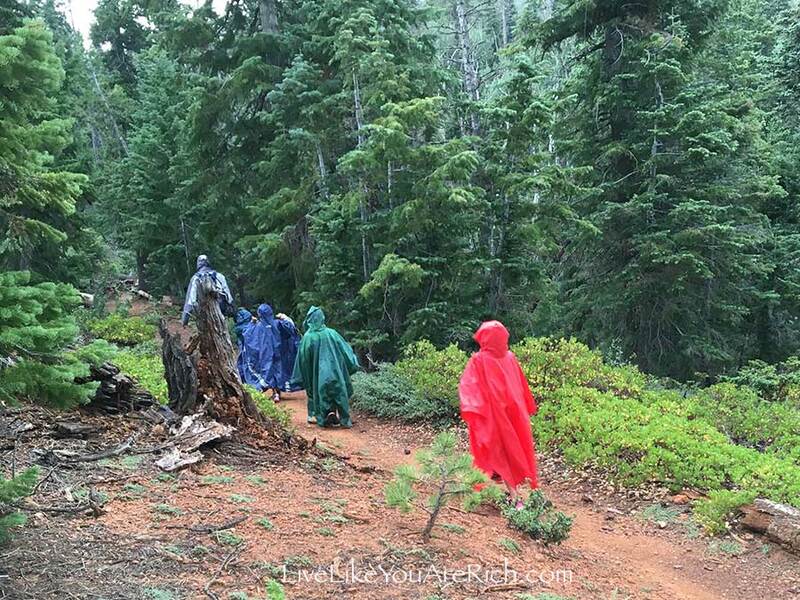 A little planning and know-how can go a long way in making any hike a success. My husband and I both grew up hiking and it was the thing that really brought us together. 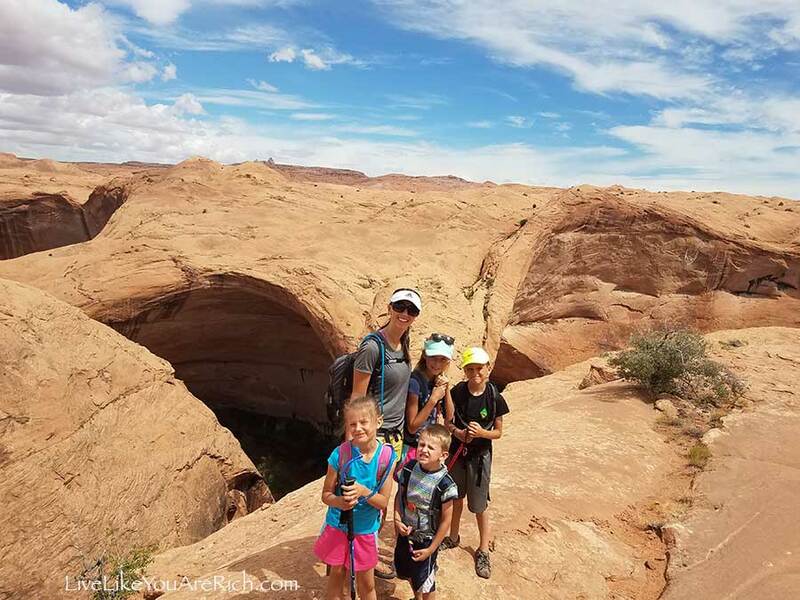 We spent six years hiking, trail running, and canyoneering together before having kids and after our kids arrived it seemed natural, although not simple, to keep hiking. We now have four little hikers, ranging from eleven to four years old who have all been hiking since before they could walk. Even our four-year-old recently hiked all the way on a challenging fourteen-mile-adventure carrying his own water and a few snacks. Hiking for hiking sake is far less fun than hiking to or through something cool! Head to a waterfall, slot canyon, dinosaur tracks, or viewpoint. If it is your kids’ first time hiking, start small. An internet search for family-friendly hikes in your area is a great way to find a trail that will work for you and to check to see if a permit is needed. Start with a well-developed and maintained trail with little elevation gain and a destination your kids will love. 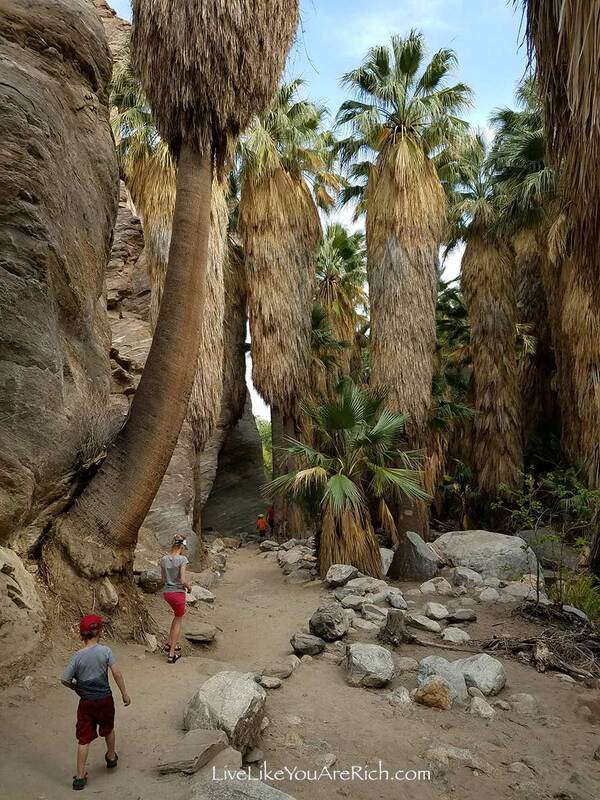 FIND A FUN TRAIL: Hiking for hiking sake is far less fun than hiking to or through something cool! 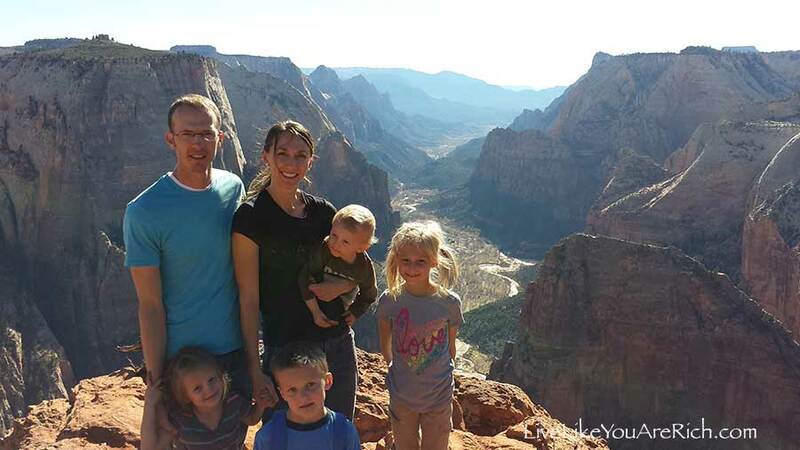 Head to a waterfall, slot canyon, dinosaur tracks, or viewpoint. If it is your kids’ first time hiking, start small.An internet search for family-friendly hikes in your area is a great way to find a trail that will work for you and to check to see if a permit is needed. Start with a well-developed and maintained trail with little elevation gain and a destination your kids will love. BRING PLENTY OF FOOD: Hungry hikers are not happy hikers! Kids generally need to eat far more frequently than adults. They will likely be “starving” before you are even hungry.Pack snacks that hold up well in a pack, are easy to eat on the move, and that will keep you full (try to include some protein and whole grains). Be sure that you have things your kids actually like to eat. Our kids would rather die of hunger than eat something they don’t really like and their likes change frequently.Try letting your kids help choose what to take. Stop frequently for snacks or munch while you hike. We bring a lightweight icepack in an insulated pocket or bag when bringing things that need to be kept cold. 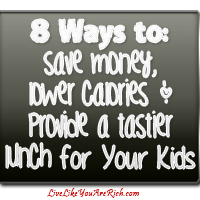 *Ideas: jerky, nuts, granola bars, trail mix, whole grain crackers, bagels, muffins or cookies, fruits and veggies, cheese sticks, applesauce pouches, sandwiches on rolls or in wraps. BE SURE KIDS STAY HYDRATED: This is important not only for keeping them happy, but also for avoiding dehydration, heat exhaustion, and heat stroke.Be sure your kids are drinking water frequently and before they are thirsty. Using a hydration pack works well because they keep water cool and make it comfortable to transport and easy to access. Having your water easily accessible will help you to drink frequently, although you may need to remind kids to pace themselves so they have water for the duration of the hike. You don’t need an expensive hydration pack.Inexpensive options have become available recently and actually, do a pretty great job. Just be sure to drain and clean the reservoir as soon as you get home to avoid mold and bacteria growth. 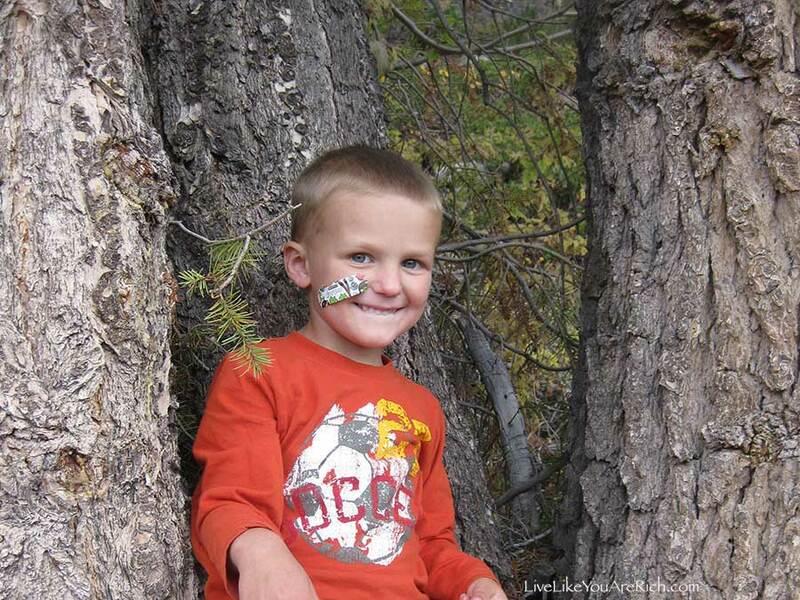 BE PREPARED FOR KID EMERGENCIES: Bring a first aid kit in your pack since scrapes and splinters are bound to happen. Be sure to pack diapers and wipes for kids still in diapers and toilet paper for older kids even if you think the hike is too short to need them (plus some zip top bags to store used items in).Kids need to go when they need to go! If your child has something they are really attached to (i.e. binky, stuffed animal, blanket), bring it on the hike. When the going gets long or tough, having that item might save you all from a lot of grief. *Tip: pack a container in your car for dirty/wet shoes and clothes to go into after the hike and possibly clean clothes/shoes to change into. BE SURE KIDS HAVE GOOD SHOES: Having shoes that keep your kids’ feet happy while hiking will help keep the whole family happy!That doesn’t mean you need to buy an expensive pair of hiking shoes for each of your kids (who will then outgrow them in about 17 minutes), just be sure they are in a pair of sturdy shoes with good traction that is right for the conditions you will be hiking in.If you will be hiking through, or even near water, make sure they have on shoes that can get wet. If you will be hiking through snow, be sure their shoes will keep their feet dry. On longer hikes, you may want to carry an extra pair of socks or even shoes to change into after feet get tired or wet. 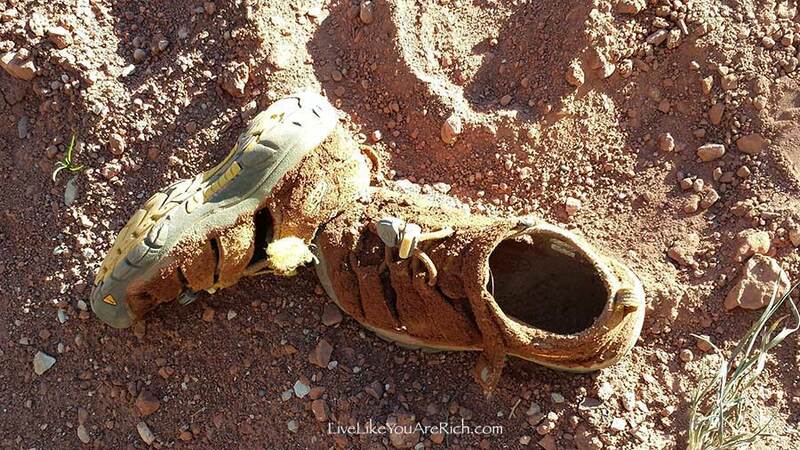 *Remember, flip-flops are never good hiking shoes! 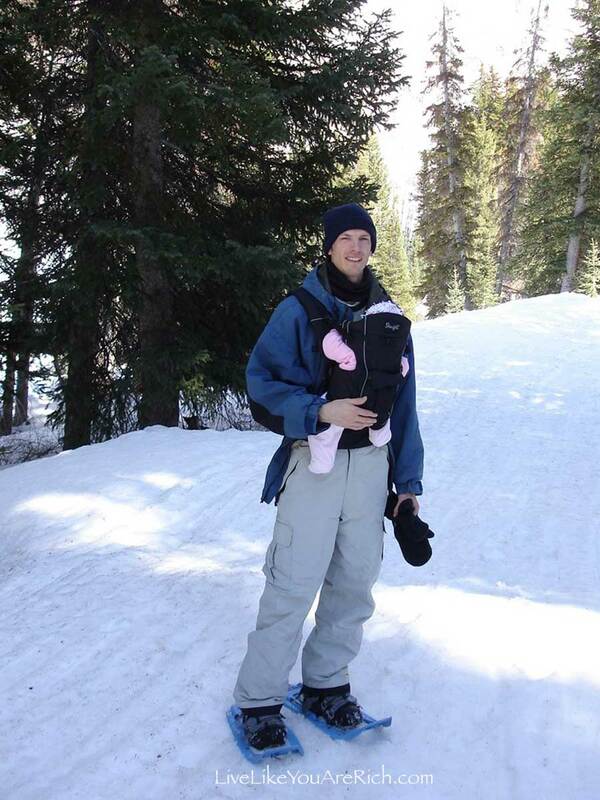 BRING A KID CARRIER IF YOU HAVE A BABY OR TODDLER: Carrying a baby or toddler in your arms or even on your back or shoulders while hiking can be quite dangerous. We would definitely recommend using a well-fitting front carrier or backpack for carrying kids on hikes, both for comfort and safety.You don’t need to spend a lot of money for a pack—try borrowing one or buy one second-hand. Attach toys, blankets, and pacifiers to the pack so they are within your child’s reach, but won’t be dropped and left behind. *Remember: be sure to check frequently if your child in the pack has become too hot or cold since riding feels a lot different than hiking; they may need a warm hat and gloves, a sun hat and cool drink, etc. BE PREPARED FOR VARIABLE TEMPERATURE/WEATHER CONDITIONS: The temperature can vary a great deal over the course of a hike because of changes in the terrain, weather, elevation, and time of day.We hate hiking with extra stuff to carry and, of course, so do our kids! However, a jacket and a few other warm items are usually worth their weight. If there is a chance that things could cool off, have your kids tie a warm, light-weight jacket around their waist and throw a beanie and gloves for each person in a pack—they can make a big difference in keeping warm. 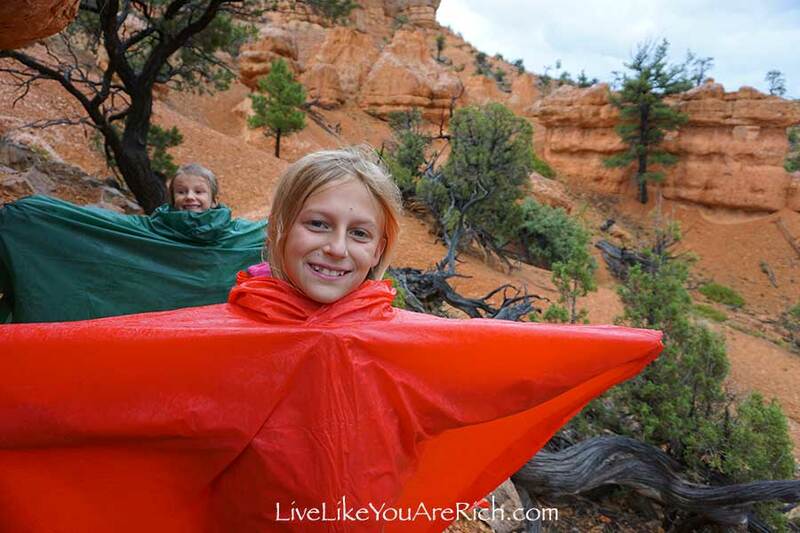 *Tip: We like to keep a small bag of disposable ponchos in our pack and a few hand warmers. pply sunscreen and bug spray before starting your hike and bring more sunscreen along for reapplication on longer hikes. *Tip: Make a rule that kids must stay within eyesight no matter how badly they want to run ahead of adults. 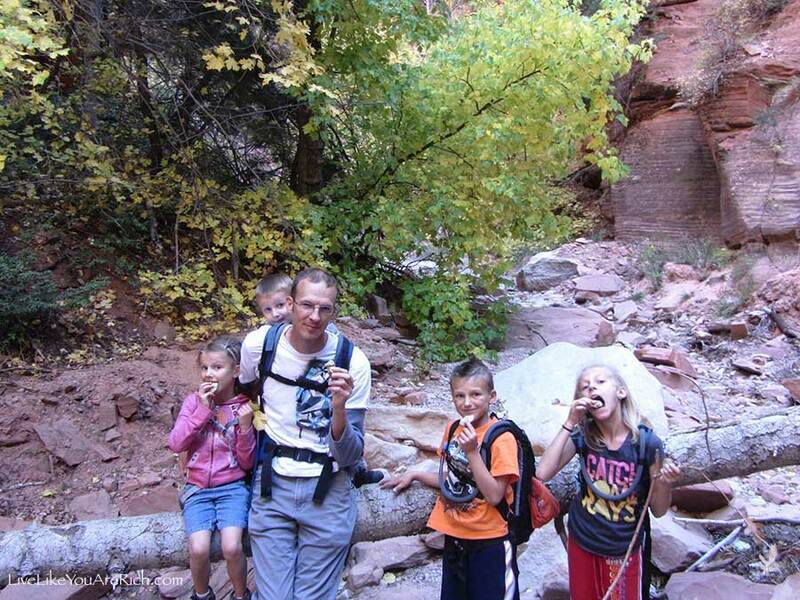 FIND WAYS TO MOTIVATE KIDS: When asked how we get our kids to hike long distances our answer is: fruit snacks! 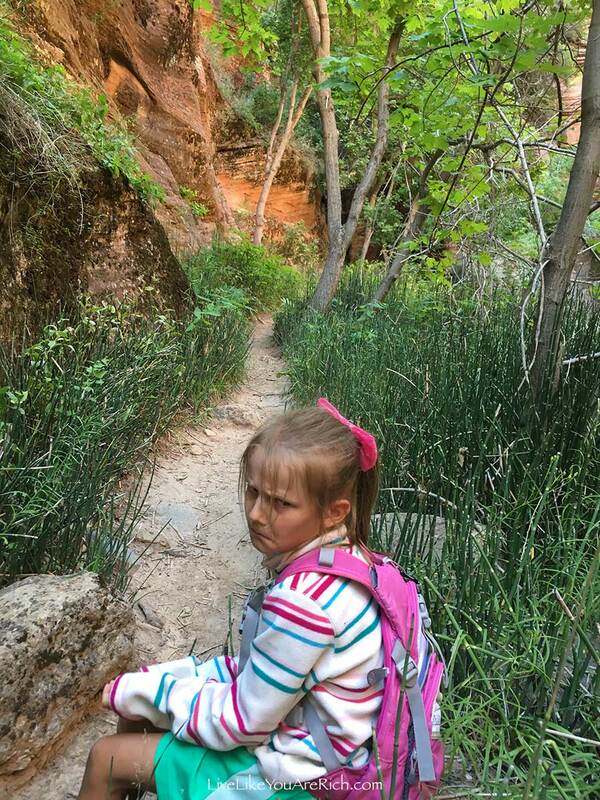 There are lots of other ways to help motivate kids who are lagging on a hike.What works will depend on your child. Stay positive! Remind them regularly about the cool things waiting for them at your destination—waterfall, frogs, rope swing, etc.Use a device or an app that tracks your mileage and get your kids excited about how far you’ve come. 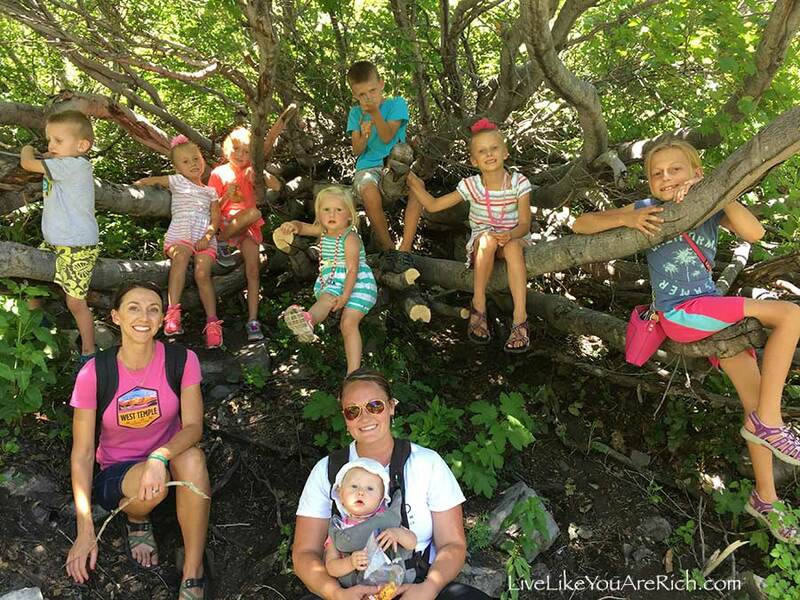 Hiking at the back of the group can be demotivating; giving kids a chance to be the “leader” can help them pick up the pace.Keep them talking, sing silly songs, or make up stories together as you hike. Treats may work well, either along the way or waiting for them after the hike; this could be candy breaks along the way, donuts waiting in the car, or a visit to an ice cream shop on the drive home. SCHOOL YOUR EXPECTATIONS: When you plan a hike, you will likely have a picture in mind of how it will go. It probably won’t.Sometimes hikes will exceed your expectations in every respect, but sometimes kids will sabotage your plans and things will be a bit rough, especially if hiking is unfamiliar to them.Our kids have hiked regularly all their lives and can occasionally still surprise us with how awful they can be on an off day!Don’t give up if your first attempts don’t go as planned. 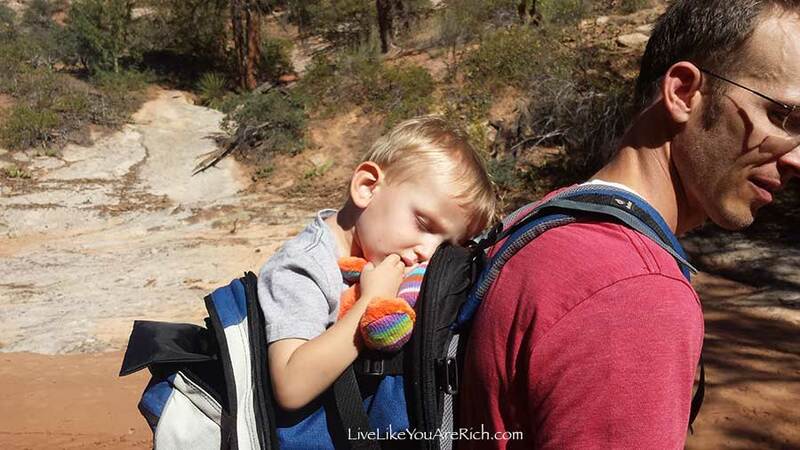 Just start small and work your way up to the bigger hikes you’d like to do as your kids’ hiking abilities increase. 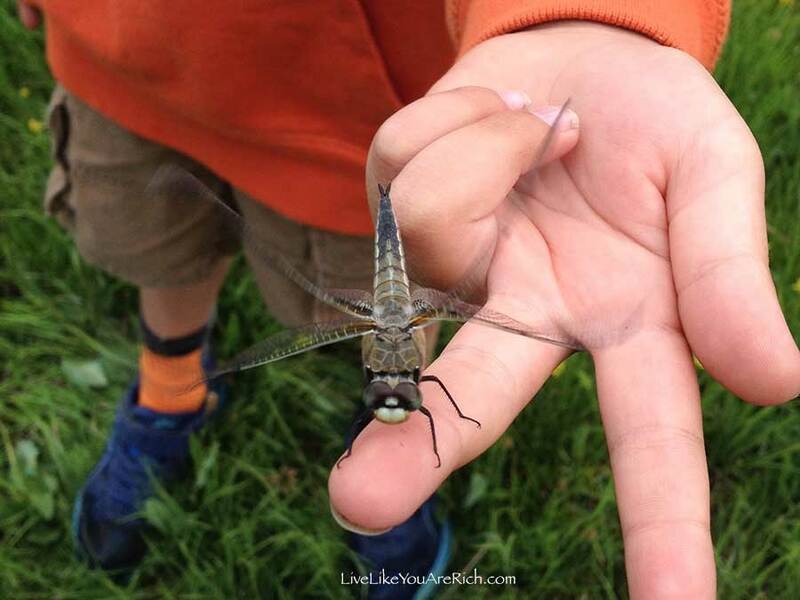 TEACH KIDS TO LEAVE NO TRACE: When we are out hiking we have to teach and remind our kids to help take care of the beautiful things we see so that every person who visits that spot can enjoy it too.Because more and more people are getting out and enjoying the great outdoors it is more important than ever to teach kids to follow Leave No Tracepractices—for example: pack out all trash (even if it is biodegradable), dispose of human and pet waste properly, stay on the trail or on durable surfaces, don’t carve your name etc. 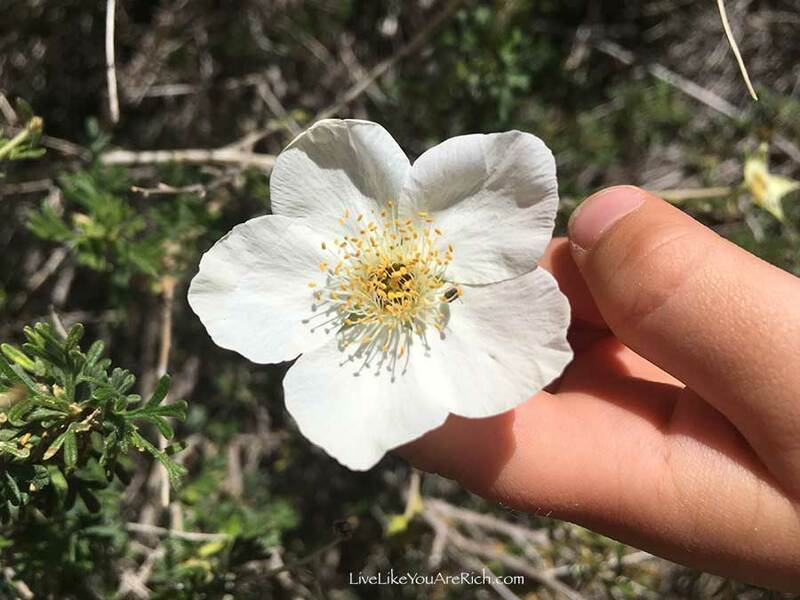 in rocks or trees, and leave the flowers and other cool finds along the trail for everyone to enjoy.Nothing ruins an outdoor experience quite like finding someone else’s trash or graffiti or hearing their music blaring. 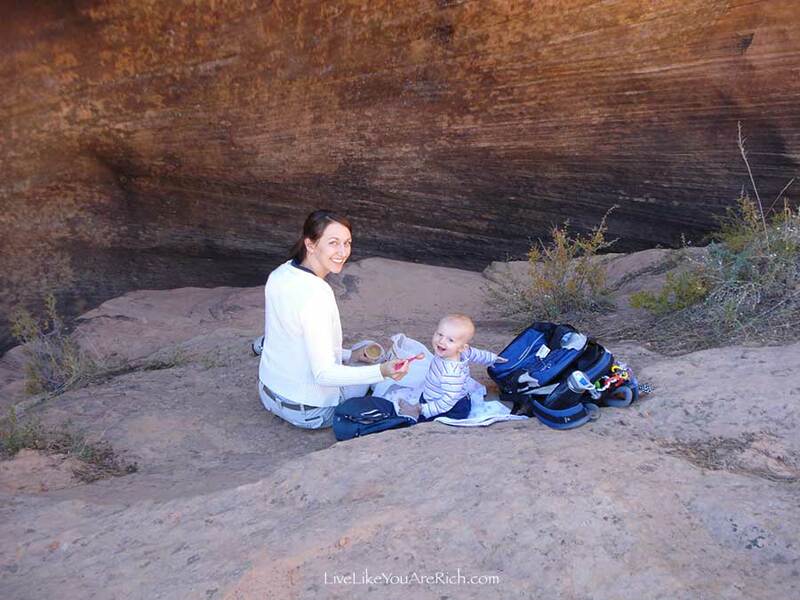 TAKE BREAKS AND ENJOY THE JOURNEY: Without our kids along, my husband and I are able to cover a lot of ground hiking. It still sometimes shocks me how slowly we can go as a family.However, I have discovered there are lots of benefits to going “kid-speed-ahead,” as we like to say. 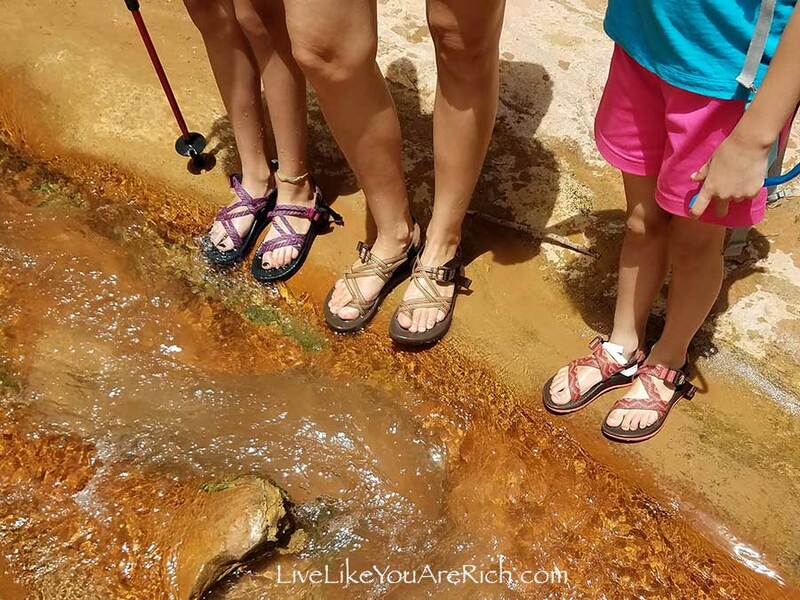 I have loved watching our kids discover nature along the way and seeing things through their eyes!We’ve stopped to smell flowers and tree bark, felt cold streams and fuzzy moss patches, made whistles from grass and reeds, caught insects, lizards, snakes, and frogs, climbed trees, rocks and into caves, relaxed at wading spots and for long lunches, and searched out fossils, beautiful pebbles, and animal tracks that we would never have enjoyed without our kids along. Take breaks, take pictures, and enjoy every little aspect of the journey! 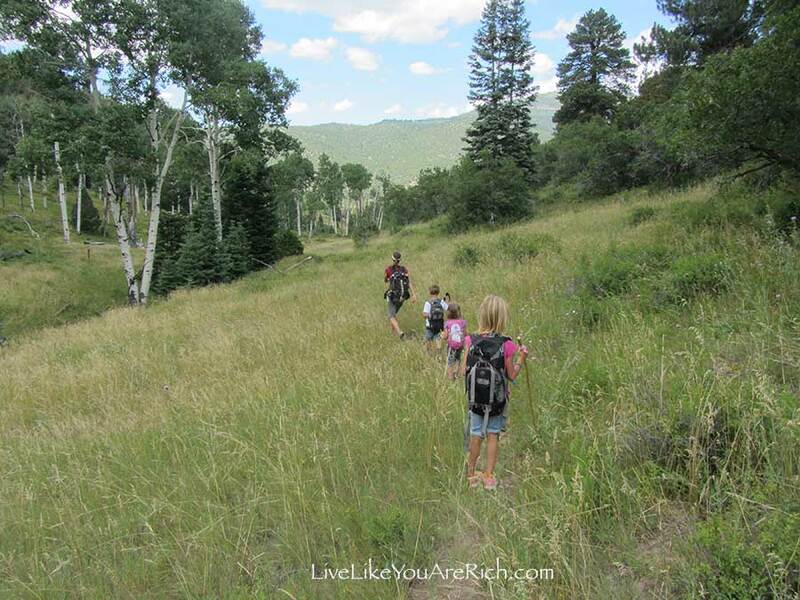 12 Tips for hiking with kids. Julene! Thank you for sharing your experience and wisdom. As you know we are struggling to find our new “normal” now that we have a little one. Hearing you describe your “ kid speed ahead” philosophy was inspiring. I love adventures with you and your family, and hope to teach my kids to be adventurous, resilient, and a team player like you have yours. Thanks Miranda! Yeah Julene is quite impressive how she keeps her kids active and participating! What a great article! I kept thinking “Yes, of course.” It all makes perfect sense and is easy to apply. 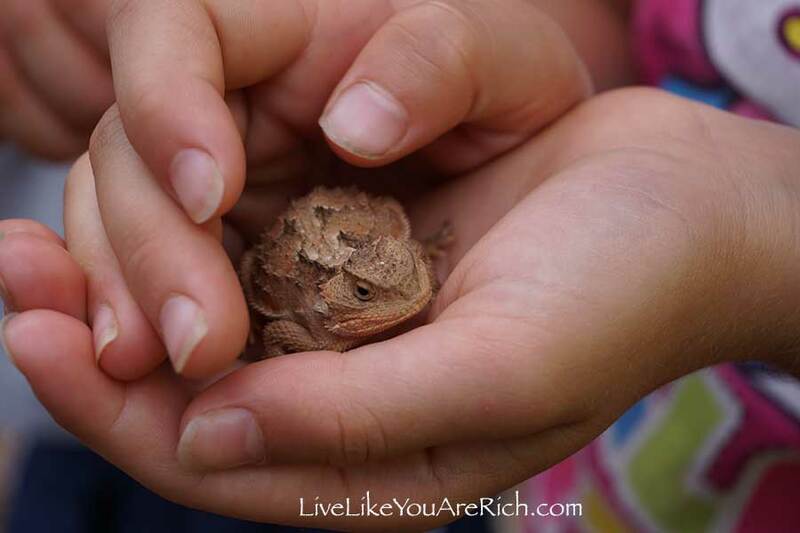 I especially loved the part about teaching kids ‘Leave No Trace’ principles. It was also encouraging to hear that even a family as used to being outside and active together may have an off day. Thanks Julene! What a great article on hiking. I will apply these suggestions, even if it’s just an urban hike.